Take that, analysts! That's what Apple is saying this morning after announcing that it has sold a record-setting 3 million iPad Minis and fourth-generation iPads since going on sale Friday. While Apple didn't break down sales between the two, analysts at Piper Jaffray predicted Apple would only sell 1.5 million Minis in the first few days. Apple sold 3 million of the new iPads in the first weekend of its launch in March. But with that version it had WiFi and 3G-4G units on shelves at launch. With the Mini, only the WiFi version launched this week; the 3G-4G versions will launch later this month. In addition to the Mini, Apple also released a slightly updated version of its larger iPad. The fourth-generation iPad has a new processor and dock connector. With the sales of both products combined, Apple is calling this a launch weekend record for the iPad. 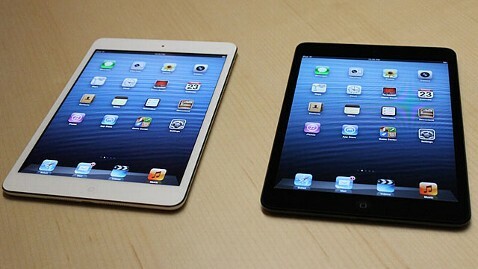 The iPad Mini joined a few other popular smaller tablets on the market, including the $199 Nexus 7 and Kindle Fire HD. Asus, the maker of the Nexus 7, has reported its sells close to 1 million units a month. The new iPad, which starts at $329, has a smaller 7.9-inch screen than the regular 9.7-inch iPad. While the Mini has a lower-resolution screen, it still has all the same capabilities as the other iPad since it runs iOS 6, the latest version of Apple's operating system for the iPhone and iPad. Despite the recent superstorm, the Mini was sold out at various stores in New York City this weekend. Apple has begun to allow customers to reserve the tablet online and pick it up in-store the next day. "We set a new launch weekend record and practically sold out of iPad minis," Apple CEO Tim Cook said in a statement. "We're working hard to build more quickly to meet the incredible demand." As a result of last week's executive shakeup at the company and predictions of lackluster iPad Mini sales, Apple's stock dropped to less than $580. Apple was trading at $582.72 a share this morning.